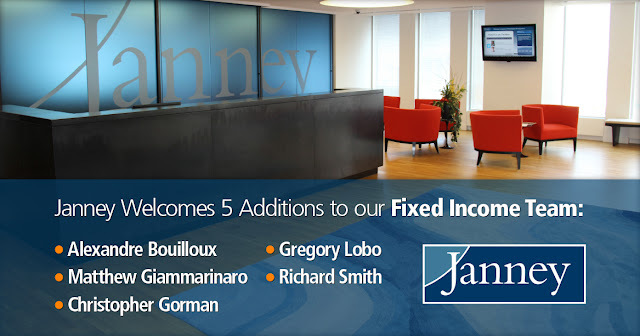 PHILADELPHIA, PA –May 25, 2016 – Janney Montgomery Scott LLC (“Janney”), a leading full- service wealth management, financial services and investment banking firm headquartered in Philadelphia, PA, today announced the hiring of five new fixed income professionals. Alexandre Bouilloux, Matthew Giammarinaro, Christopher Gorman, Greg Lobo, and Richard Smith have all joined the firm. “Adding talent is integral to our strategic growth plan of building out a premier institutional fixed income platform,” said Michael McNamara, Head of Fixed Income Sales. “The knowledge and leadership of these professionals enhances our core competencies and strengthens our commitment to provide outstanding service to our clients,” said McNamara. Alexandre Bouilloux, Credit Research Analyst - Alex joined Janney from Credit Agricole Corporate & Investment Bank. Prior to Credit Agricole, he spent time with UBS AG, a Wealth Management Research firm. Alex will be based out of Janney’s New York office. Matthew Giammarinaro, Director, Fixed Income Sales - Matt joined Janney from RBC as a Director in the Securitized sales group. At RBC, he was a Non-Agency Residential Mortgage trader. Before RBC, Matt held positions at the Federal Housing Finance Authority, Bank of America Merrill Lynch, 400 Capital Management, and Countrywide. Matt will be based out of Janney’s Charlotte, NC office. Christopher Gorman, Director, Fixed Income Sales - Chris joined Janney from Bank Hapoalim Securities in New York where he was a Fixed Income Generalist. He has been highly successful over the course of his career and has over 20 years of valuable cross-asset sales experience. Chris will be based out of Janney’s New York office. Gregory Lobo, Director, Fixed Income Sales - Greg joined Janney from Canaccord Genuity in New York where he sold High Yield debt. Before Canaccord, Greg traded Investment Grade and High Yield debt at PrinceRidge Group LLC, formerly Cohen & Company Capital Markets, LLC. He spent the first 20 years of his career at HGK Asset Management, where he was a Partner and Principal. Greg has been highly successful over the course of his career and has over 25 years of valuable cross-sector credit knowledge. Greg will be based out of Janney’s New York office. Richard Smith, Director, Fixed Income Sales - Rich joined Janney from GMP securities in Dallas, TX (formerly Miller Tabak) and brings over 24 years of extensive experience in the High Yield markets to the Janney platform. His early experience was at TCW in Los Angeles as a Managing Director and Senior High Yield trader. Rich will be based out of Janney’s Dallas, TX office.